Two weeks ago I was walking out the back to take the pictures of the spreading petunias and I saw this tiny visitor on one of the plastic chairs on my patio. She was less that 1″ big and the only reason I saw her was that she moved a little when I walked past. I quickly ducked back into the studio to change lenses from the wide-angle telephoto to the macro. Fortunately, she cooperated and stayed there until I got back. It was a little bit harder getting the photo, though, because I had to get fairly close to take the picture. She kept skittering across the top of the chair. I wanted to get a side shot of her so that it would be clear what she was. Back and forth across the back of the chair I chased her. But she didn’t try to jump off or fly away and I finally took enough photos that I felt one would be good enough. She really was a pretty green, without the brown from a larger set of wings. Growing up, I never was afraid of bugs in general. I found all of nature vastly fascinating. 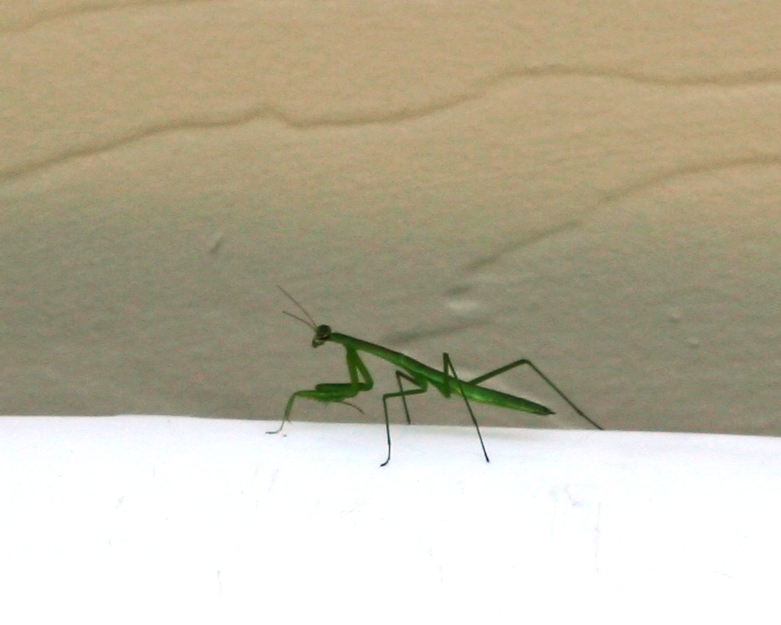 Once I brought back a full-grown mantis that was over 6″ long from Grandma’s house. We fed her crickets that we found around the yard. I’ll spare you the gory details, but it was all quite interesting to me. The only exception was spiders. I would run away screaming if I saw one. Wolf spiders were especially awful. I’ve gotten better over the years and can tolerate smaller ones these days, but let me just say I don’t go looking for trouble. The rule stands, outside the house you are safe, inside, no holds barred even if it is John who does the holding. One of these days I think I am going to sit in the chair that the mantis occupied and try some plen air drawing. The view is quite lovely and it would be wonderful to relax with my pen and ink or whatever and just play around. I planned to go and pick berries this morning but ended up not doing so. We got about .75″ of rain overnight and it was going to be too sloppy out there. I don’t mind getting a little wet, but these berries are so fragile that if I pick them all soaking, they will tend to crush themselves a little more lying in the picking containers. Can’t have that. I had almost finished the next entryway and decided to do that instead. I did get to talk to someone knowledgeable about slate tiles and he said the best came out of Vermont. They tended to last the longest and have the most color variation in them, including some yellows and rusty colors. He said that the ones that were mostly blue were probably from Pennsylvania. I don’t know quite what to believe because we put Pennsylvania bluestone on our front porch and though it is predominantly blue, some pieces are almost solid shades of rusty orange. Who knows? It’s just really pretty. 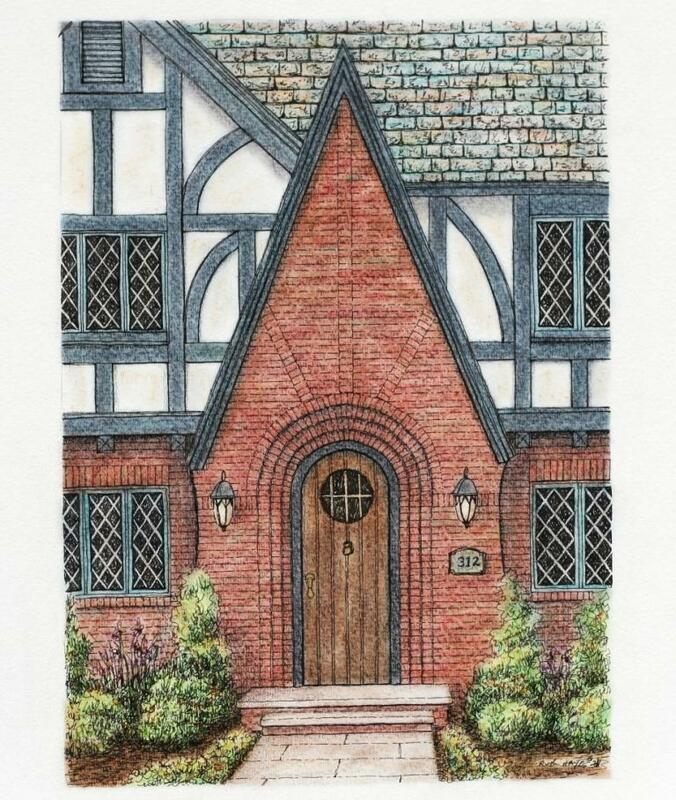 I like the choice of the blue/grey trim with the brick and the slate roof and I think that the diamond grids are a better fit than the square colonial grids. You can now see the recess of the front door a little better and I think it adds a little bit of distinction to the entrance. At last I have finished the inking of the next drawing. I have had lots of delays not the least of which is the coming of wild black raspberry season. And nothing interferes with raspberry season. I noticed a few getting ripe on the driveway and so I have spent a few morning hours here and there keeping track of how the ripening was going. It has just started to be worthwhile to get up early in the morning and pick this week. Today I spent 2 1/2 hours picking 3 quarts of berries. It may not seem like a lot, but it is. The largest of them are only as big as my first fingernail. Most range closer to my pinkie nail. Still, the weather was good for picking – cloudy and fairly cool. It looked like rain but it didn’t so I just kept on picking. I have been known to pick when the tornado sirens are going off (it’s a county-wide alarm so I wasn’t in danger where I was). I’d just about have to be in an electrical storm to give it up. For the next two weeks it’s going to be a toss-up between berries (1st) and computer and art. Fortunately, there has to be a few days between pickings to let more ripen and I won’t try again until the weekend. Later in August it will be blackberry season, but that is for another time. Anyway, here is the inking of the latest drawing. It is more Tudor in style with the stucco and beam work over the brick. I like the steep roof line over the entry. It must be close to a 20/12 pitch. I’m glad I didn’t have to put the slate shingles on that! I also liked the way that the brick was curved in 4 tiers over the doorway. 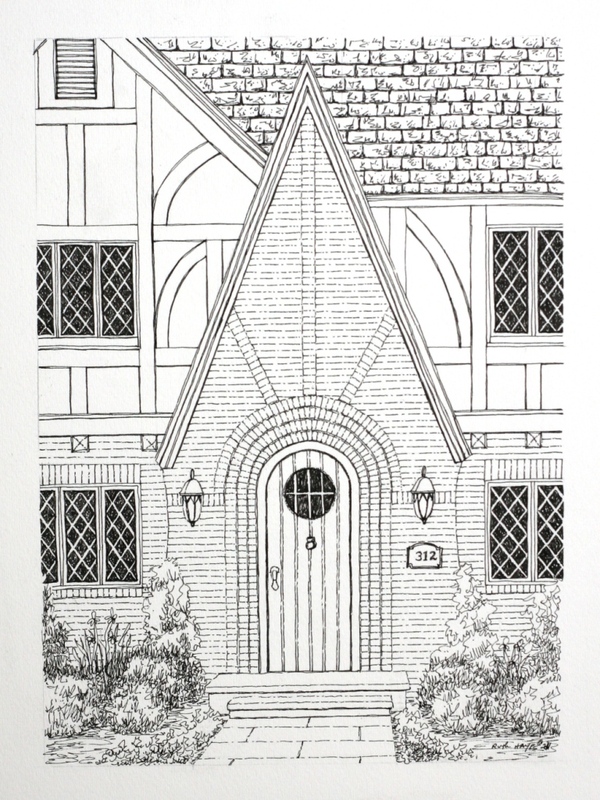 The door is actually gently recessed from the front of the house perhaps a brick’s worth at each arch. Not enough to put the door in shadow, but just enough for a little architectural detail. You’ll be able to see it more clearly with the color. The sections of angled brick are pretty too. They will be a little more subtle when I put in the pastels. I did take some artistic license with the windows however. Somehow the colonial grids that were there didn’t seem quite right , so I changed them to diamond grids. That seemed a little more appropriate. Once again I was awake when I was supposed to be sleeping – and once again I was thinking of the gift tags. Plus, this week I didn’t get past the pencil drawing of the newest entryway for many reasons, not the least of which was an all day road trip Tuesday to Ohio with John. What time I did have, I spent exploring the possibilities of making digital prints of some of my original aceos/gift tags. I chose these mostly because all of the little gift tags already had the ribbon hole punched and I didn’t want to have to work around that. I also selected a few un-inked watercolor blanks. I really liked the unusual color patterns they had and didn’t think inking would improve them so I put them in as is. In any case, I scanned a bunch in using my printer scanner and then was actually able to find where they were sent onto my computer. No mean feat for me as this was the first time I had tried to scan with the new printer. Unfortunately, I wasn’t happy with the print out from my computer. The colors weren’t even close to true when compared with the original. This left the box stores as the only option. I actually thought that this might be the case anyway, given the cost of home printer inks. So I decided to try one box store for a color print out with nine and the other store with a print out of 16. Both actually worked out well and were rather evenly priced so it’s a tossup. I’ll probably go with the closest store in the future. I spent the rest of the week cutting out each tag from its sheet from a total of 18 sheets. Rather mindless work but necessary. Then I had to punch the hole and insert the ribbon. I opted to also put a hole reinforcer on this set just to see if I felt it was necessary since I was using 120 lb cardstock. I may not in the future but I haven’t decided yet. They actually look pretty nice. The colors turned out quite vividly and I am pleased with the combinations. So what was I thinking about in my midnight musings? Probably the hardest decision of all. Pricing. I am thinking of selling them as a set of nine, just to make it easy on myself. I have given myself a day or two to think about it. It is always fun to give the place where you live a name. When our property was bought everyone involved thought long and hard about an appropriate name and after some discussion, all decided that a good name would be Wild Crane Overlook. We had seen several cranes and/or herons in the creek that runs through the property and since we planned to put in a lake, we were sure that they would eventually show up there. Besides, it had a nice ring to it. In the course of building our house we decided to put a weather vane on top of the gazebo. John looked far and wide on the internet and finally found something we felt was very suitable. Even though we realize this is probably a heron instead of a crane, we have often seen great blues in the shallow end of the lake, so it is still a good choice. After the roofers finished shingling the gazebo, we had the vane installed on top. I liked it there rather than on the house or garage because I can see it whirling around in the breeze from the decks and inside the house. As many have experienced this spring, we have had some pretty hellacious winds this year. Though the tornadoes have fortunately missed us, we have had some pretty strong straight line winds. 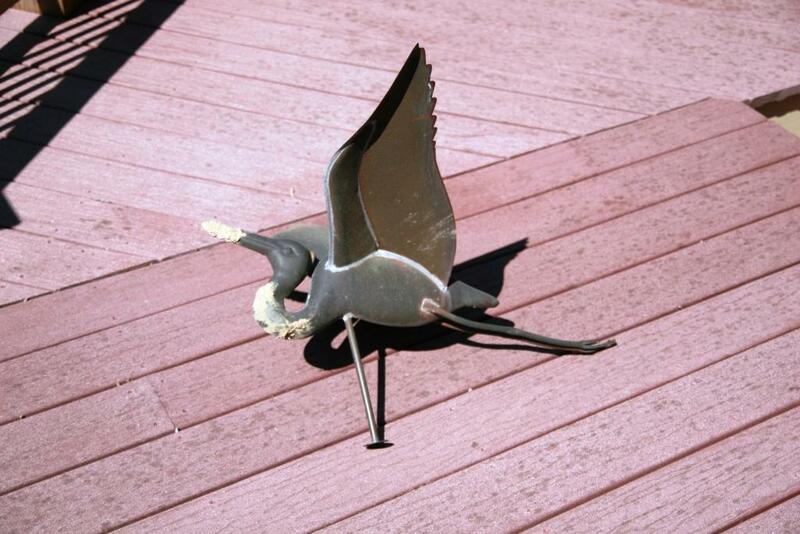 Even so, imagine our surprise when John found the crane lying out in the grass one morning, yards away from the gazebo. As you can see, it was unharmed (except perhaps for its dignity). It landed face first into the lawn and got a muddy beak and chest for its troubles. I’m just glad it didn’t land on its feet for surely they would have been broken or bent. What I wouldn’t have given to see that metal heron take flight on its own. I have been told on occasion that I must have a green thumb. Nothing could be farther than from the truth. The reality is that I get plants, indoors and out and if they live, they live and I keep them, and if they die I don’t get anymore of those. Through a process of attrition I have learned what will survive with a minimum of care. Nothing exotic for me. If it looks exotic and pretty that’s fine but I have a rule. I only plant it once. And none of this put it in in spring and take it up in the fall. If you can’t make for a whole year – too bad – no second chances – usually. I have broken that rule once in a while, but not very often. As a matter of fact, when we built the new house and I had to start from scratch, there were two plants that were supposed to be good to -40. Both were evergreen types and had a pretty little spring flower. I think one was pink heather and the other was bog rosemary. I lost about half of them over the first winter and decided to break the rule and replace them. I should have kept to the rule. Many of the new ones died and most of the ones that had survived the first year succumbed. I gave up on them and have moved on to the next. I do try to pick plants that are fairly cold tolerant needing little care. The no care rule extends to mulching over winter also. 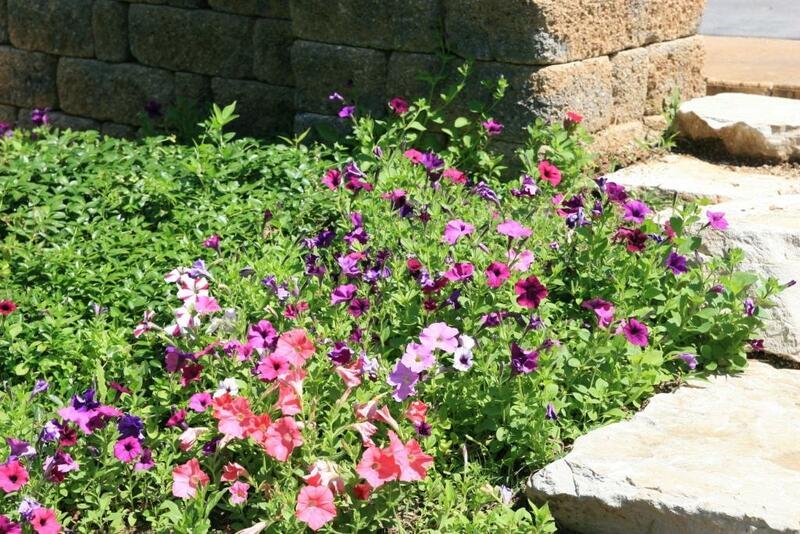 The only exceptions are the few annuals for the flower pots and the petunias along the stone steps. There is a lot of gravel just a few inches below the ground and I can’t really plant much there except some shallow rooted annuals. I have managed to get some daffodil bulbs going and I wanted something to cover the ground when they die back. I never liked petunias much when I was growing up but I decided that the spreading wave petunias (wave means expensive, you know, as in wave your money goodbye) would be a good choice. They have actually done very well there, spreading up to a square yard each and lasting well into October. Last year I had a few volunteers come up in mid summer quite far from the stair area. I never knew that they could come up from a stray seed so I thought how lucky I was and perhaps that birds had helped spread them. This spring when I went to look and see how everything had survived the drought of the fall and the very cold winter, I saw what looked to be petunias coming up where I had planted them last year. Surely not. In the spirit of doing the minimum of yard work, I decided to let them alone for a while and see what they might really be. I went ahead and planted some wave petunias just in case I was mistaken (which was most likely given my plant identifying skills). Low and behold after a few weeks it became apparent that they were indeed petunias. They are starting to bloom. The flowers are a little smaller than this year’s new ones and I can’t tell how much they will spread, but I love the fact that they have reseeded themselves. I have more coming up about 25 feet away. 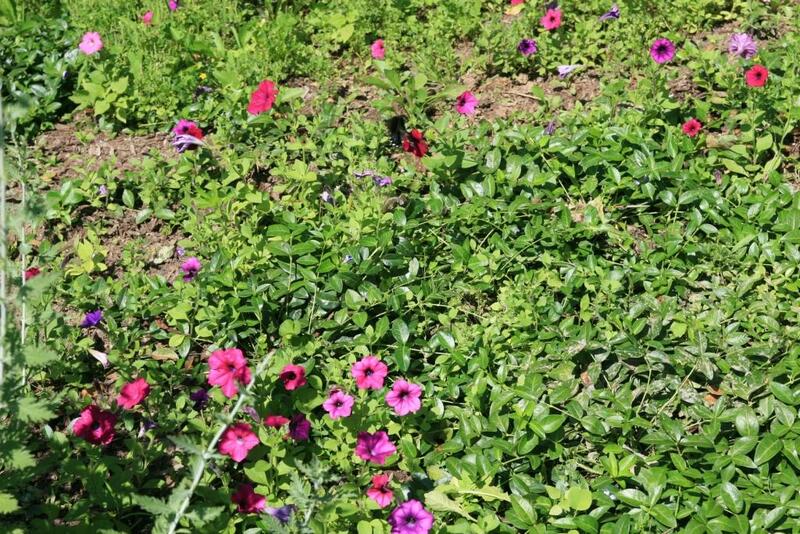 The colorful petunia blooms are quite lovely coming up in the midst of the vinca where they were never planted. I think I’ll let them stay. Oh, and I asked my mother and aunt who they thought planted the hardy peonies and both agree that Grandma was not a flower garden person. Great Grandma must have planted them at some point. Neither could remember the first time they remember seeing the peonies, but they must predate the early sixties. That means they really are 50 to 100+ years old. I am betting older rather than younger. Last night I woke up at about 3 AM and started to think. This is usually not a good thing. Sometimes, when I get just enough sleep, my mind wakes up enough and I can’t fall back to sleep again. This time I started to think about my online Etsy store. Yesterday I got the opportunity to participate in an online promotion and I am trying to figure out how to do it. The number of items required is rather prohibitive for me to supply. It just takes too much time to make up my originals. 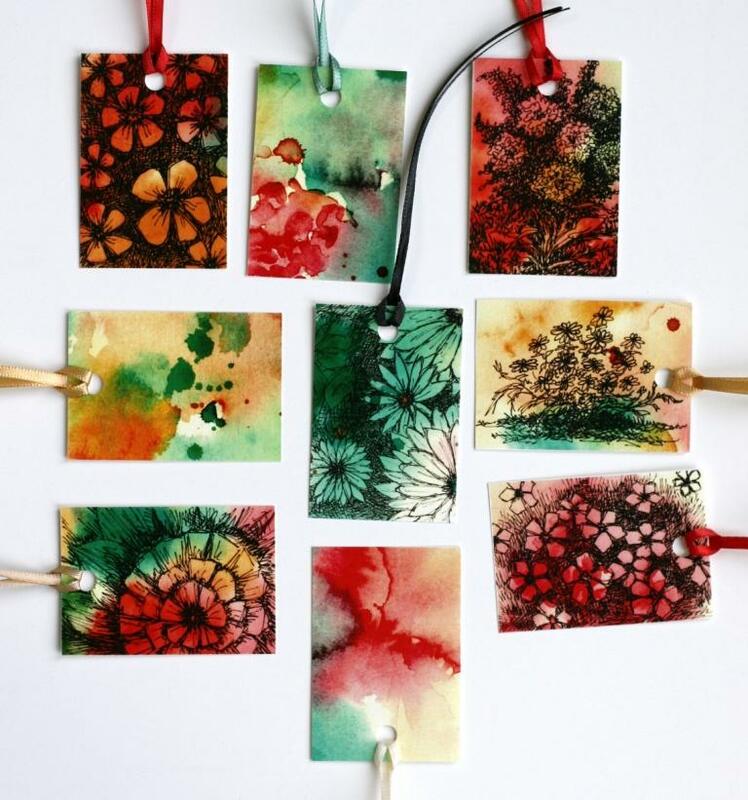 Even the gift tags take more time than anyone would think, if you include making the watercolor sheet, cutting it, drawing, and then punching a hole for the ribbon. So there I am, awake in the early hours and thinking about how I can resolve this delimna. It came to me that possibly I could print up some as a contact sheet and then cut them up and sell them as just plain old printed tags instead of originals. It would take me a little time to work out the details, but maybe it could work. I guess I’ll have to think about it, preferably not when I am supposed to be sleeping. 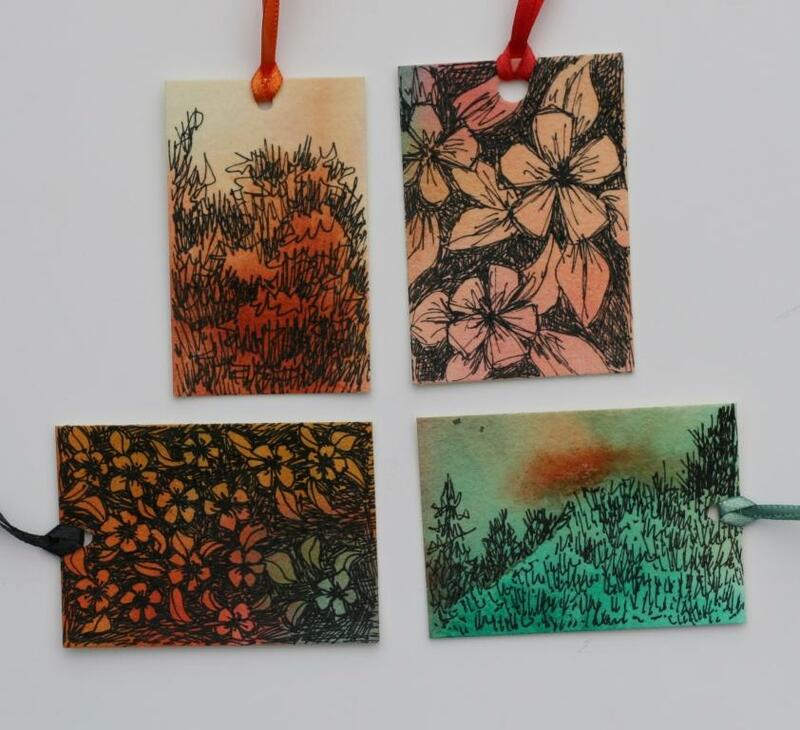 And in the spirit of my tags, here are a few more samples.